High performance Hot Melt glue dispensing systems for manual hand controlled or fully automated use. A range of robust melter units with heated hoses, pattern controllers, nozzles and accessories. For product assembly or carton packaging as well as many other applications. 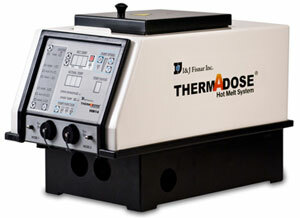 THERMADOSE® Positive-displacement, all-electric Hot Melt systems are designed to provide the ultimate in temperature controlled thermoplastic delivery and dispensing for industrial applications using pressure sensitive adhesives, contact adhesives, waxes and sealants. Machine options are available for non-adhesive processing applications that require ultra-clean delivery, these systems are designated as “NA.” Products are RoHS compliant and CE approved. Selecting a hot melt system. A simple six step approach in selecting a complete hot melt system that help make the right decision for your application. And of course our engineers are available to discuss your application in more detail by phone or email.